My latest column in the j. has published and it is full of fall treats. 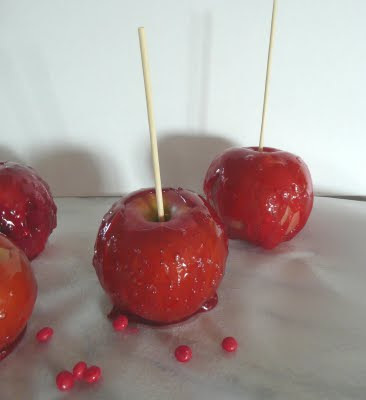 Try the Cinnamon Candied Apples for Simchat Torah or even Halloween or just for fun. 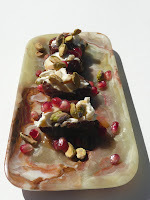 The Dates with Marscarpone are stuffed with an orange-flower water and marscarpone cheese mixture, drizzed with caramel (or date) syrup and accented with pistachios and pomegranate seeds. They make a wonderful accompaniment to tea or a nice dessert to a rich meal. See my column and the recipes here. Looking for other fall treats -- check out all my recipes including pumpkin (chili, couscous, mini-tarts) plus lots of advice on how to select and cook the hobgoblin of winter squashes here. Want to make caramel apples instead of candied? Follow the recipe on the back of the Kraft caramel's package, or check 101 Cookbooks' all-natural version here. About the photos: Top candied apples with cinammon decors. Side, the dates on a marble plate from Vietnam. Click on the photo to make it bigger. I really liked it full size but it's hard to tell the dish from the dish in the small photo. Wash and dry the apples. Skewer them securely through the stem end. Set aside. Line a baking tray with parchment paper, grease with oil or spray. Set aside. Fill bottom pan of double boiler (or improvised double boiler) with water, set top pan inside, making sure it does not actually touch the water below it. Put the double boiler on high heat. Once the water boils, lower and keep at a simmer. Carefully transfer the syrup to the top of the double boiler. Working quickly before the sugar mixture cools, dip the apples one at a time in the sugar mixture. Swirl them in the syrup or spoon the sugar mixture over them until they are completely coated. Place on the greased parchment paper until the glaze hardens. The number of apples you can candy will depend on their size, how quickly you can work and how rapidly the syrup hardens in the top of the double boiler. Store the candied apples in a cool place. Orange flower water, which adds a delicate citrus note, can be found in some liquor and gourmet stores, as well as in Middle Eastern markets. If using, beat it with the cheese using a fork in a small bowl until combined. Slit each date lengthwise to remove pit. Stuff each date with a generous teaspoon of the cheese mixture (or plain cheese). Refrigerate until 20 minutes before serving. Just prior to serving, place on serving platter, drizzle with the caramel sauce or date syrup (found in stores specializing in Middle Eastern food products) and scatter nuts and pomegranate seeds on top. Gary and I just shared the last leftover apple. I had wrapped it well in parchment paper and then plastic wrap and kept it in the fridge. It must have been 2 weeks old. The fruit was a bit tired but the glaze was still zippy and crunchy and the whole thing tasted great. So you can make these ahead, just wrap them as I describe.